As Comet 67P/Churyumov–Gerasimenko sneaks closer to the sun, the Rosetta orbiter is capturing dramatic outbursts from the ever-more active comet. This jet was so powerful, it momentarily out-puffed the solar wind, creating a rarely-observed diamagnetic cavity. 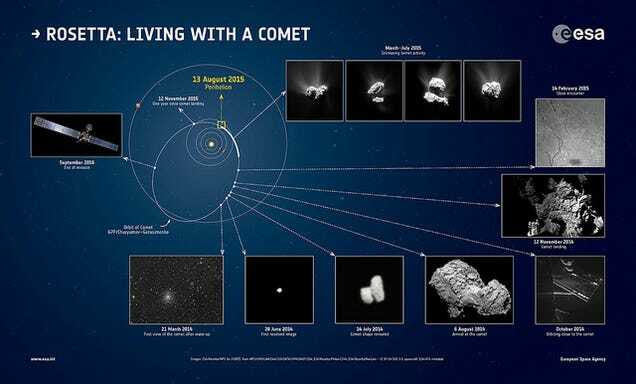 Comet 67P/Churyumov–Gerasimenko will reach perihelion on Thursday, August 13, the closest that it will get to the sun during its 6.5 year orbit. As the comet creeps closer to the sun, it is growing more active. Ice is sublimating directly into gas that explodes in dramatic dust-loaded jets, whilechunks of ice ranging from a meter to a whopping 40 meters in diameter are shucking off the comet and falling into space. Fractures are splintering across the surface, and up to 40% of the previously-smooth plains have remouldedsince Rosetta arrived in orbit last year. This beautiful jet appeared, spurted gas and jet into space, and vanished again all in under an hour on July 29, 2015. The jet originated from the rugged Anuket region on the comet’s neck. The Rosetta spacecraft was 186 kilometers above the comet’s center of mass at the time of the outburst. 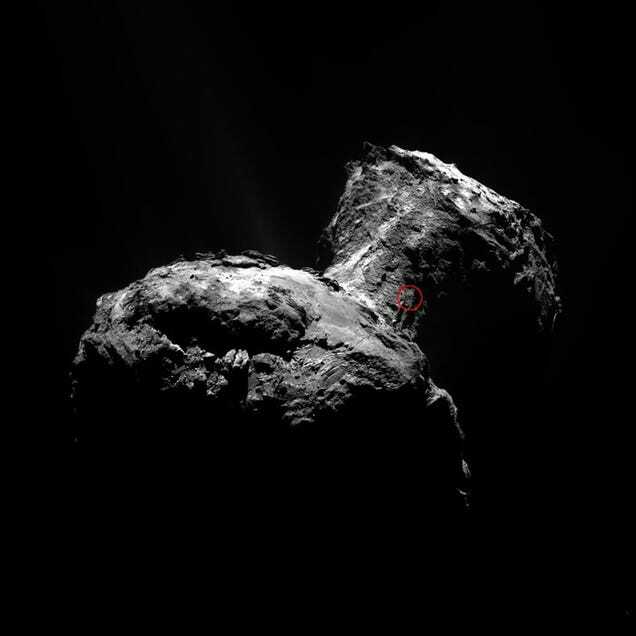 This isn’t the first jet the team has observed from the comet, but it is the brightest. Normally the jets are significantly dimmer than the rest of the comet, requiring an extreme contrast stretch to make them visible in photographs. This time, the jet was brighter than the comet’s nucleus. 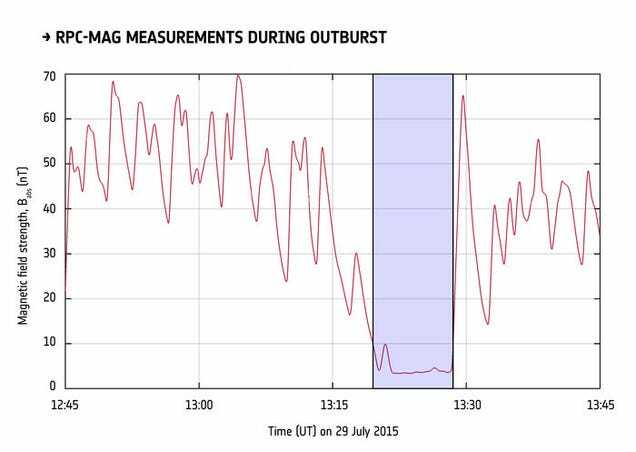 The outburst produced a diamagnetic cavity, a temporary drop in the comet’s magnetic field. The comet is not magnetic, so its magnetic field is entirely the result of the solar wind. With gas escaping from the comet at a velocity of at least 10 m/s, researchers suspect the jet’s outburst was powerful enough to deflect the solar wind. The outburst of gas temporarily shoved the perpetually-smothering solar wind farther from the comet’s nucleus than usual, changing the pressure balance. It was powerful enough to push this cavity all the way out to Rosetta, creating a magnetic field-free region that stretched at least 186 kilometers away from the comet. The science team was hoping to find diamagnetic cavities on Comet 67P/Churyumov–Gerasimenko, although smaller than the one observed on Comet Halley. The new observations of this brief pocket in the solar wind will provide important data on comet/solar wind interactions. 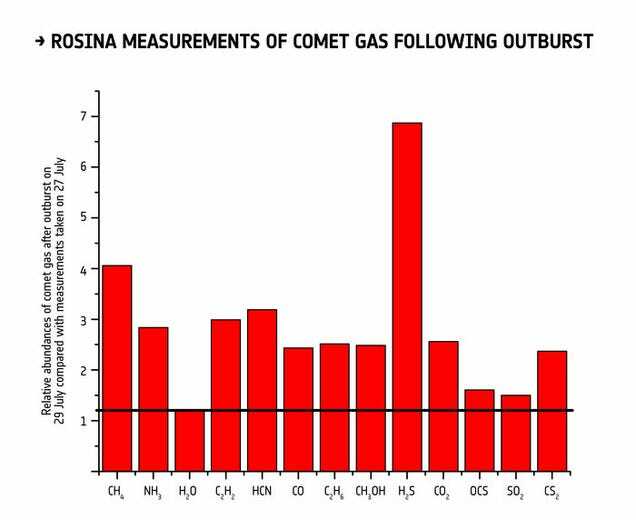 The gas envelope surrounding the comet, or its coma, had twice the carbon dioxide (CO2), four times the methane (CH4), and seven times the hydrogen sulphide (H2S) after the outburst compared to two days earlier. 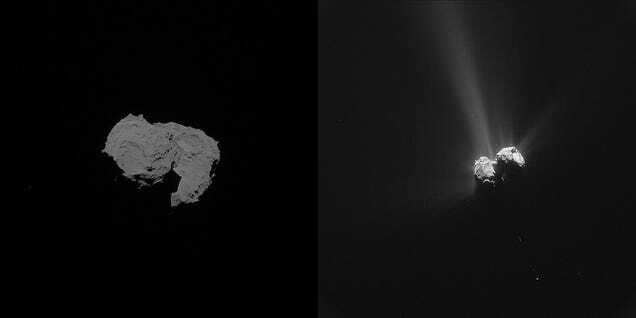 The nasty-smelling combination has draped the comet in the stench of rotting eggs and farts, offering faint mercies that the highly-anthropomorphized Rosetta spacecraft isn’t actually alive and possessing a keen sense of smell to go with the mass spectrometer. Of all the gases monitored by the instrument, only the water (H2O) content stayed roughly constant. The comet is most active at perihelion because sunlight is flooding into areas that have been shadowed for years, suddenly bumping surface temperatures. The comet’s activity is expected to lag, peaking in the weeks following perihelion on Thursday. While in this highly active phase, the Rosetta spacecraft is pulling up to 300 kilometers away from the surface to hopefully avoid the worst of the shedding boulders, jets, and any other unpredictable activity.